Update: Jeff Pierre is the winner! He has already responded to claim the prize. Thanks to all that entered! 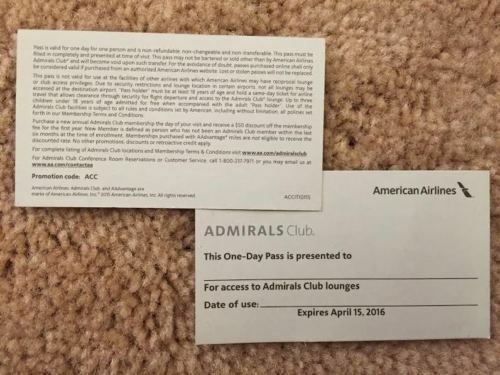 A kind reader of mine (Christian) commented on a recent post that he was looking to get rid of a couple expiring AA Admirals Club passes and I offered to help by having a giveaway on the blog. It is quite simple to enter the drawing for these free passes – simply leave a comment on this post telling me what airport you would use these passes at. Since these passes expire in a month please only enter if you know you can use them by 4/15. I will select the winner, using a random number generator, on Tuesday night (3/15) at 9pm EST and put you in touch via email with Christian so he can mail you the passes. Based on when they are mailed, you will have a little less than 4 weeks to use the passes. Using it at O Hare. Oh we would love to have the passes. My husband and I both in our 70’s are flying April 1 Boston to Miami – Miami to Milan. 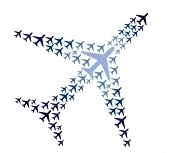 April 15 flying Rome to Madrid – Madrid to Philadelphia – Philadelphia to Boston. Would use the passes in one of the airport lounges to rest and relax a bit. I would use them for my wife and myself at JFK. I’d use them on a connection at JFK. I’d use them at LAX and PHL towards the end of the month. I’m traveling to hear a jazz band piece of mine premiered in Hershey, PA. I will use them at ORD on our way to Barcelona! Flying out of DEN at month end. Would make good use of the passes! Oh the choices of airports to use these at. Either LAS, ORD or JFK. They would make a fine resting place at either of these choices. Good luck to all!! Ralph, I still haven’t heard from the winner. I just wanted to make sure everything was ok.